Southampton City Council has delivered the first phase of a new city-wide charging network with the introduction of 30 new electric vehicle charging points. 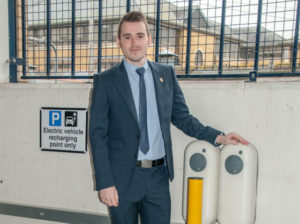 Southampton City Council Cabinet Member for Sustainable Living, Councillor Christopher Hammond with two of the chargers in the Bedford Place car park. Located in five of the city’s multi-storey car parks, the charging points from NewMotion are available for use by any car park customer and will be free for an introductory period. However, drivers do need to register and order a charge card. The council’s wider charging point plans will also see fast and rapid chargers introduced where there might be demand. The council is also running a number of incentives to facilitate the uptake of electric vehicles in line with its Clean Air Strategy, including a 90% reduction in annual city centre season ticket parking fees, and offering taxi drivers cashback on licensing fees if they replace older more polluting vehicles with low-emission alternatives – this has seen 16 diesel taxis replaced with hybrid cars. Electric vehicles will also be able to benefit from toll-free crossing on the Itchen Bridge later this year. Southampton City Council will also expand its current Clean Air Zone to introduce access restrictions and penalty charging in 2019, with the council due to announce the boundaries for the zone and which vehicles will be liable for charging later this year following a local level air quality technical assessment.